Knit One Crochet Too’s Marco Polo is a unique multicolored yarn. 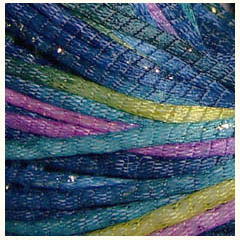 It consists of a cotton yarn core inserted inside a nylon tube and highlighted with metallic flecks. There is a tiny bit of glitz to this yarn, but it is very subtle. 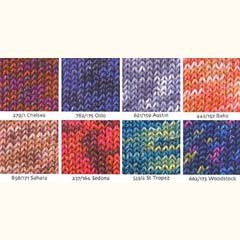 This yarn has good stitch definition, and works well for both lace and textured patterns. Marco Polo is suitable for scarves, sweaters, vests and evening wear.